Pictured above is the menu board in the kitchen I’ve lived in in San Francisco for the last 8 years. See the rest in this kitchen tour. Why would I lead a cause that I don’t fit the demographic of?! I will celebrate my 48th birthday in July and only 13% of our Facebook followers are in the 45 – 54 age range. 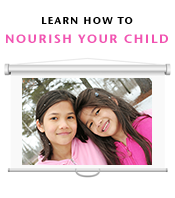 I conceived of and founded Nourishing Our Children in 2005, at the age of 39. I wasn’t sure whether or not I would still have an opportunity to have children then. I wasn’t married yet. I didn’t want to adopt, or utilize a sperm bank to raise a child as a single mother. Nonetheless, I cared deeply about our children, in the collective sense. I was working as a learning specialist in private practice at the time and had begun to suspect that the children I served who were faced with “learning disabilities” were likely malnourished. I have a long history of caring about and working with children and families as a babysitter, live-in nanny, teacher, tutor, Marriage Family Therapist, and Art Therapist. I know from first hand experience that we really are what we eat, and that vital nutrients during pre-conception, pregnancy and during our formative years are necessary for optimal development of every aspect of our being. I am referring to nourishing the wide smile on both a physical and emotional level. My mother grew up on a traditional diet in Morocco which was rich in nutrient-dense organ meats and pasture-raised animal products. They didn’t have a refrigerator in her early years and there were no canned or packaged foods. Just like Dr. Weston A. Price discovered – those on a traditional diet ate no processed foods of any kind. She is number 8 out of 11 children. My grandmother conceived 14 children and 11 survived. She didn’t necessarily space them 3 years apart, which we recommend. Yet, my mother and all her siblings had a wide palette, all 32 straight teeth … no need for an orthodontist! My mother migrated from Morocco to France where I was born and she favored modern foods such as margarine and low-fat products. Even though my mother breast fed her 4 children for an extended period of time, we are an example of the physical degeneration that Dr. Price observed time and again that occurred when the so-called “displacing foods of modern commerce” were introduced into the diet. All 4 children in my family have had crooked teeth. I had 8 adult teeth pulled from my mouth – including wisdom teeth … and wore head gear and neck gear for several years. I would describe myself as having had extensive orthodonture. So what’s wrong with crooked teeth? Can’t we just fix them with braces? Yes … however, there are other issues that develop when one is malnourished that can’t be fixed with braces. I have a fairly narrow nasal passage and don’t breath comfortably. I have been identified as a mouth breather. The ends of several teeth have become translucent because my mouth isn’t closed at night when saliva would remineralize my teeth. My breathing had been restricted enough that I had nasal surgery in 2010 in order to widen my nasal passage, reduce the size of my inflamed turbinates and correct a deviate septum. Unfortunately, I still experience my nasal passage as constricted as I breathe through my nose. My tongue is too big for my small mouth that houses only 24 teeth. I also have had weak bones as a teenager that resulted in stress fractures, and was diagnosed with osteopenia at 38. I have relatively mild, yet clearly visible scoliosis of the spin. I talk about this pattern in the article How The Teeth Tell The Tale. So, I have learned through my own life experience that our bodies require certain nutrients to develop as we are intended to. We need a wide smile to fit all of our 32 teeth and tongue comfortably, and a wide face that allows us to breath easily. Once I was an adult, I became a vegetarian and at times a vegan throughout my twenties and into my thirties. All during that period, I was emotionally unstable, at times suicidal, often depressed and anxious. When I started to eat according to Nourishing Traditions in 2004, my moods stabilized dramatically. I have never again experienced the depths of despair I had in the years I lived primarily on a plant-based diet. I don’t have children, so what do I care?! Quite simply, I care because I don’t want the next generation to suffer in the ways that I have. I don’t want parents to regret what they didn’t know, to regret their possibly uninformed choices. I care because I hold a vision for our children, as I express on our website and in all of our educational materials. Imagine a child raised according to the nutritional wisdom of our ancestors. This child grows up free of the common ailments and diseases that we currently take for granted. This child’s strong, white teeth grow in straight – and free of tooth decay. This child’s face is broad and well formed. This child is attentive and engaged, and can learn easily and readily because of optimal brain development. This child is energetic by day and sleeps soundly at night. This child is sturdy but not overweight. This child has a strong immune system, experiences only mild versions of childhood illnesses or allergies, and has a stable, cheerful and optimistic disposition. We know it is possible for every child to be healthy, intelligent and well formed because Dr. Price documented and photographed whole communities in many parts of the world where this picture of childhood was a reality generation after generation. His photographs, descriptions and startling conclusions are preserved in a book considered a masterpiece by many nutritionists and health professionals. Nutrition and Physical Degeneration by Dr. Price documents the foods that allow people of every race and every climate to experience their birthright of radiant health and wholeness. These are whole, natural foods that have not been industrially altered with pasteurization, extrusion, additives, preservatives, hormones, antibiotics, pesticides or herbicides. These are foods that come from animals living outside and eating their natural diets. These are foods that generally don’t come in cans, packages, boxes or microwaveable containers. These are foods that have continually proven to support health and well-being in our children. In celebration of our 8 year anniversary, our educational materials are currently on promotion until June 30, 2013 for up to a 60% reduction in our usual donation request. Donate to our cause and learn how to nourish and not merely feed yourself and your children. I don’t think I am exaggerating when I assert that this information is life changing! What has your experience been that has led you to our cause? 30 Responses to I don’t have children, so what do I care? We have been on GAPS to heal my two daughters guts (4 and 2) for almost a year. The birthday parties were the hardest because of all the criticism. I found a cupcake recipe, candy recipes,and a couple cookie recipes that I would make in advance depending on what the host was having. I would also bring our own meals and try to make them as close to what was at the party as possible. Of course, there was still some criticism, but it kept my daughters feeling included. Now that we are coming off of GAPS I am letting them have a cheat here and there at parties. Their guts and immune systems are in great shape and I trust that their bodies can handle a little junk. It’s not perfect, but I cannot (and will not) keep them in a bubble. They still get all the great stuff every day at home! You are doing the right thing, and you have a good reason to be disappointed in your mummy friends. You are healing your children’s bodies, and it is very unfortunate that they cannot see and be supportive of that. Your daughter will learn to be strong and follow her convictions because she has a mother like you. I am sorry it has been so difficult with your friends. I am even more sorry that it has effected your daughter’s relationships. I can say that my friends have been pretty great through the whole thing, but my family has been a bit difficult. Ah well. Some people will never get it, but our children will be healthy and strong, inside and out. Thank you for your passion and love to create Nourishing our Children. I am so grateful for the resource and connection with others. Your selfless gift of time and energy is appreciated more than I can express. I can totally relate to your life experiences….being 50….having only 24 teeth….suffering many teeth pulled, orthodontics, health problems, vegetarian adulthood…..Only realizing in the past 2 years that all of this was not just a fact of life but a condition we have created by forgetting our traditions. In my family, we are three to four generations away from eating traditional foods and our children show the effects. I am determined to mitigate the damage done in my 9 year old son through the ignorance of myself and the several generations before me. I can relate to you as a teacher too. The behavioral and academic problems of my students over the last 26 years of my teaching have exploded. My intuition just screams to me that it is largely due to nutritional deficiencies. So sad….it brings me to tears at times. Thank you for caring for humanity and our future so much and turning that caring into positive action for change! Thank you for your empathy and companionship on so many levels, Nancy. I have shed tears of grief as well that we’ve lost our way, in my opinion and the consequence has been so high! I believe that our cause, Nourishing Our Children, is what I was intended for in my lifetime. Everything I’ve ever learned is utilized as I serve – from my bachelor’s degree in visual communication to my years as an educator to my training in non-violent communication. I appreciate you as a part of our community very much! Lynn – I too am a mom of two young kids. Mine are 6 & 3. I am fed up at the pervasiveness of junk everywhere and the attitude that if you say no, you are crippling your kids socially. And I hate that in most ways that’s true. Society needs a new normal, and we need to blaze that trail. I resent that my kids have to be the isolated trail blazers. And I resent all the junk I’ve let them have trying to be “normal”. Blecht. Yes, we definitely need a new normal. It shouldn’t be so difficult to avoid food coloring, GMO’s and other junk. I’ve been lucky to find some like-minded parent friends who eat like we do. To some extent, I even helped create this group by using the educational materials provided by Nourishing Our Children. I still lack support from extended family, who will shake their heads and insist that I’m doing something terrible to my daughter. I just shrug and continue to educate people as best I can, hopefully without turning them off too much with my own attitude of righteousness. Form a society of like-minded people. Start with Meetup groups, Facebook groups. Sandrine, you have a greater vision for children than most parents do! Good for you! I appreciate your posts and the work you do. I am 50, live in the southeastern USA, am married with 7 children (ranging from 4 to 26) and 5 grandchildren (ranging from unborn to 3). We also homeschool, and most of the people we socialize with and go to church with are on the WAPF path, so that makes it so much easier to eat well in social situations. We’re still not eating “perfectly,” but we’re staying away from the big baddies such as margarine, MSG, HFCS, processed foods, etc. We also drink raw milk and eat lots of homegrown eggs. And we’re so blessed that our extended family is with us on this, too. Being surrounded with like-minded people can be such a blessing. Ginger, I agree with you wholeheartedly! think community makes an incredibly difference! Sandrine, you should be very proud of the tremendous work you have done in creating and leading Nourishing Our Children. I never knew much about your background before, besides that you had roots in Morocco. My cultural background is different, but otherwise we share a lot in common. My mom grew up on a farm in Orem, Utah, during the Great Depression. I’m pretty sure they had a cow and therefore raw milk and butter, and they had chickens, and an orchard, and a garden. Growing up, we ate margarine, corn oil, extruded cereals, “space bars,” Tang, and Carnation Instant Breakfast, etc. I always *knew* butter was better, though I couldn’t have articulated why. We did eat meat and vegetables, we didn’t eat much fast food, and I never developed a soda pop habit (never drank even much diet soda), so it wasn’t all bad, and certainly my hardworking mother did her best. (She was a single mom for four years, then remarried and got 3 stepkids to add to her original 4, and had to go back to work after maybe two years as a stay-at-home mom.) This is just what modern people ate, right? I also went through vegetarian phases, was tormented by a sugar addiction, yeast infections, bloating and cravings and occasional binge eating. I had dental problems, cystic acne, menstrual pain and eventually endometriosis, and years of depression. I think I found Nourishing Traditions and Weston A. Price in about 2003 or 2004. My adoption of these “strange” ideas was very slow and faltering, but every bit helped, and now it is definitely a way of life. I am so grateful to have learned about Real Food and I’m trying in my own way to share what I have learned, too. Thank you for sharing your journey, Jeanmarie! I can related to a lot of it, of course! According to Sally Fallon Morell, most of our physical development such as the wide palette is decided during preconception and in the womb however, there are those in our community who claim that the trend to physical degeneration was reversed even later in a child’s development. I too ate a steady stream of processed food as I grew up – low fat milk and all sorts of extruded cereals such as Lucky Charms and Fruit Loops, for example. I don’t want that depleting diet of non-food for our children! I actually never realized you don’t have children. I was convinced you did. The way you write about children, their needs and wants and stuff just had me convinced you spoke from experience. Thank you so much for all the amazing work you do. Please do keep it up. We need as many people like you to spread the word. Thank you Diana! I am experiencing this as an incredible compliment! I have a lifetime of experience with children on a professional level and have had the pleasure of befriending many personally. Thank you so much for sharing your story. Like you, I don’t have children–but I am still hopeful that one day I might. (Still in my 30s) I study all about nutrition and development now so that I will be prepared to 1) take care of my own kids or 2) offer advice to loved ones, if solicited. Thank you so much for your work. Laura, keep us posted about your journey toward motherhood! Thank you for taking a moment to respond! I am most grateful for what you’ve shared! Thank you for the quote and the words of appreciation! Thank you Sandrine! I am 68 and became a Chapter Leader for the same reasons. I have 3 children and 4 grandchildren. I am English and was born towards the end of WW II. Food was rationed for many years even after the war, so my mom’s diet was not that great before, during and after pregnancy. We were breastfed. All my second teeth were decayed as they came in, I had many pulled because of that or they didn’t fit. Always having throat infections as a child, tonsillectomy at 6. A vegetarian in my 30’s, lost more teeth! Depression etc. WAPF diet has been my saving grace. We had 20 moms show up at our Chapter meeting when we showed “Nourishing Our Children”. I am deeply touched by what you’ve shared! Thank you for showing our presentation to your community! Hi Sandrine. This is wonderful to share. I think we can all point to our own physical shortcomings but to open up about depression and anxiety is helpful. To me the most important thing about eating a traditional diet is the mental change, no weight change (although better tone), and no amazing stories of physical change as a result of turning to real food but a noticeable stabilizing mental state that I describe as content. I am wondering why you think that you and your siblings, coming from a traditionally fed mother would experience such health problems. I would expect to see greater problems further down the line not the next generation. God bless you, Laura – and thank you for taking a moment to comment. Let us know how we may support you! Thank you dear Sandrine for all your efforts for us all: parents children health practitioners and the greater community. The wisdom combined with the beautiful and clear presentations help us take it all in in practical ways. We all benefit from Nourishing Our Children! OMG, Sandrine, I didn’t even know you don’t have children, I dont have children of my own either, but i love your movement, and i’m very very concerned about our future generations. I have kids in my house every summer and i think of them as “my kids”, but really it doesn’t matter mine own or my cousin’s or neighbor’s kids, it is our duty to care and guide them.